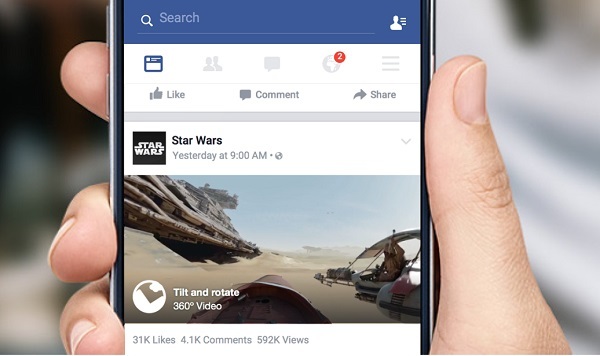 Facebook debuts 360-degree videos. Starting today, 360-degree videos will begin rolling out in News Feed. If you're using Facebook on the web or on Android, you should be able to see 360 videos in News Feed soon. Facebook plan to roll this out for iOS in the coming months. To create 360 videos, a special set of cameras is used to record all 360 degrees of a scene simultaneously. This means that when the video is playing on Facebook, you can choose what angle you want to see it from. On the web you can do this by dragging around the video with your cursor, and on mobile devices you do it by dragging with your finger - or even just by turning your device. You'll be able to hold up your phone and the 360 video will follow you as you turn, looking around, to experience things from all over the world like never before. In the future, imagine watching 360 videos of a friend's vacation to a small village in France or a festival in Brazil - you'll be able to look around and experience it as if you were there. Along with updates from your friends and family, you will also be able to discover amazing new content on Facebook from media companies, organizations, and individual creators. There are a number of publishers sharing new 360 videos on Facebook today, including Star Wars, Discovery, GoPro, LeBron James & Uninterrupted, NBC's Saturday Night Live, and VICE. These videos help show the range of possibilities with this new medium. For example, Disney and Lucasfilm are debuting an exclusive 360 experience from its upcoming movie Star Wars: The Force Awakens, bringing fans inside the beloved Star Wars universe. There's also a whole world of video creators and storytellers who are at the cutting edge of exploring this medium, and over the coming days they too will be able to upload their 360 videos to Facebook.